Heat oven to 450°F. Make 1 pie crust as directed on box for One-Crust Baked Shell using 9-inch glass pie plate. Bake 9 to 11 minutes or until lightly browned. Cool completely, about 30 minutes. Unroll remaining pie crust on work surface. With desired cookie cutters, cut shapes from crust. Place on ungreased cookie sheet; bake 6 to 8 minutes or until light brown. Cool. In medium bowl, beat cream cheese with electric mixer on high speed until light and fluffy. Stir in marshmallow creme. In large bowl, mix strawberries and pie glaze. Reserve 1 cup strawberry mixture; set aside. Spoon about 1/3 of the marshmallow mixture into pie crust; top with remaining strawberry mixture, and the remaining 2/3 marshmallow mixture. Top with 1 cup reserved strawbery mixture. Arrange cut outs over filling. Cover; refrigerate at least 8 hours or until set but not firm. Store covered in refrigerator. 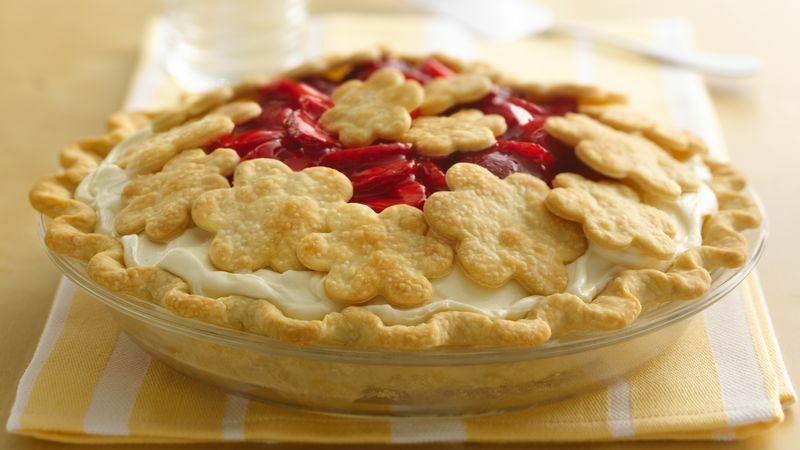 This strawberry pie recipe by Joyce Gaddie of Clinton, Tennessee, won 1st Place at the Pillsbury Refrigerated Pie Crust Pie Baking Championship, 2009 Tennessee Valley Fair.